Windows 8 and Windows 10 has a lot of in built apps and games that supports touch events. Unlike Edge and IE which are default browsers in Windows, Chrome a browser that is not designed for touchscreens. It does not mean that it doesn't support touchscreens, but the features that supports touchscreens are hidden. These touch screen features and add ons of Google Chrome are still under experiments and hence these features are disabled by default. This post will help you understand how to enable these hidden features. Let's start right away.. Create a new tab and type the below address in the address bar of the browser. Press Ctrl+F and search for 'touch'. 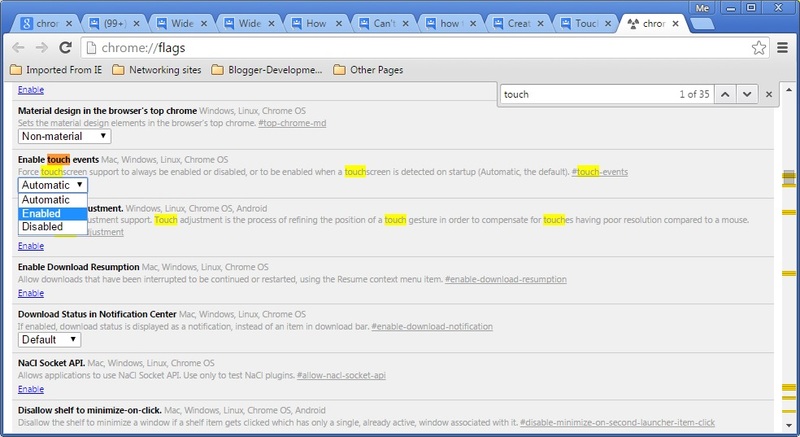 This will list down all the experimental features that has the keyword touch in it. These flags are set to Automatic by default. You have to change them to 'Enabled' to make touch working properly. For better touch experience, you may want to download Chrome Virtual Keyboard . This will improve form filling and other normal typing process inside Chrome. I hope this helps, thanks for visiting!